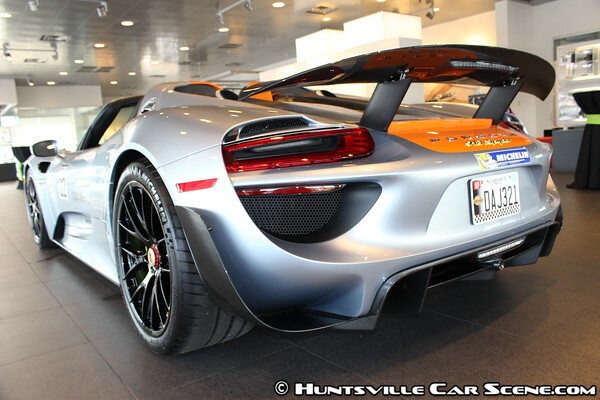 The Porsche of Huntsville showroom is elegant and sophisticated, and on Thursday, August 6th the excitement in the room was at an all-time high. It is not every day you get to see a million dollar car up close and personal. 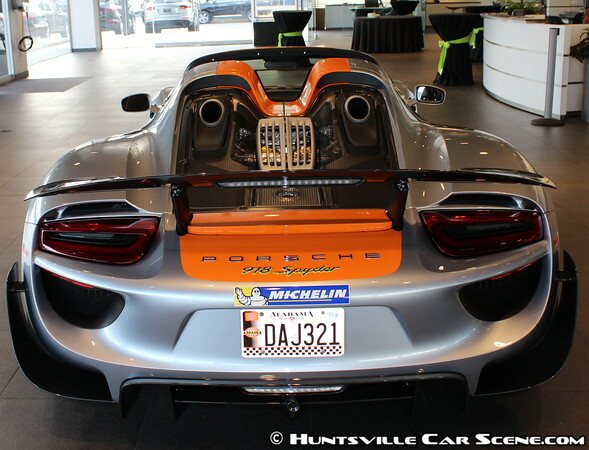 The dealership had the exclusive opportunity to order a limited edition car for a local car collector, and what a pleasant surprise they received when offered the opportunity for Porsche of Huntsville to have a “First Look” or exclusive showcase of this vehicle after its arrival. The owner was more than willing to allow this extraordinary car to be the center of attention for the evening. When you consider for a moment that only 918 of these Porsche Spyders will ever be built, it makes you wonder if any other owners in the United States allowed their local dealership to extend this special treat to local Porsche enthusiasts. The showroom was filled with local VIP’s, salespersons, service team members, as well as local Porsche club members who wanted to see this spectacle that Porsche had built. This modern marvel called the 918 Spyder sits on a prestigious shelf among other Supercars, but the Hybrid aspect makes it just a little bit more special. As the guests arrived, General Manager George Jones (Century Automotive Group) graciously welcomed everyone to the special event. Tracy Jones (President-Century Automotive Group) was also on hand to share in this once in a lifetime experience. You could sense the excitement they both shared as they were about to showcase a rarely-seen marvel from Porsche with clients, friends and family. The 918 was draped in a silk car cover and surrounded by caution barricades as if to warn the onlookers that they should approach with extreme care. Like a red carpet event in Hollywood, there was no question about who was the star of the night. The buzz in the room continued to build until George finally gave a short speech and then turned the event over to Mark Fry (Porsche Sales) who began to chronicle the car in great detail as the cover was removed. It was difficult for the crowd to remain silent as the dazzling work of art Porsche had built was revealed, and they began to lean into the barricades to get a closer look and photograph the 200 mph supercar. Engine/Horsepower – Complex, but here it goes: Both electric motors combine for a whopping 285 HP, and when working in conjunction with the 608 HP 4.6 liter V8 produces a staggering 887 HP! Zero to 60 mph – 2.2 sec. Quarter Mile – 9.8 sec. Curb Weight – 3724 lbs. The launch control system on the 918 takes the guesswork and stress out of the equation when testing this high-tech Porsche. The tiny amount of wheels spin at launch is partially achieved by its massive 325/30ZR/21 Michelin Pilot Sport Cup 2 rear tires (a mere $729 per tire). In a recent Car and Driver article the author referred to the powertrain behavior as an “On-Demand Explosion” and for good reason. It’s been said that the driver can mash the gas pedal to the floor at any time and the power plant will ignite like a stick of dynamite. The engineering feats used on this vehicle are too numerous to mention, but the extensive use of carbon fiber in the 918 helps in two areas: the overall weight reduction of the car and the rigid construction. Air ducts, scoops, and spoilers helps channel the airflow where Porsche wants it to both help cool the rear mounted engine and aid in down force of the car…after all, with the mind-numbing speeds this car is capable of, every bit of aerodynamic advantage needs to be utilized. Last but certainly not least is the gorgeous paint that the owner specifically chose to make the car unique. The color, Liquid Metal Chrome Blue, was adorned with custom painted graphics that are one of a kind and added to the allure of this beautiful beast. The owner bumped up and added the “Weissach” Package which includes upgrades too many to list, but came loaded with weight reducing options to help achieve the quickest possible times intended by Porsche as they designed this vehicle. This special package was named from the German town where Porsche’s R&D factory is located. As the special night came to a close, it was safe to say the experience was electrifying and the guest were still buzzing as they left the showroom. I’m sure they had already tagged themselves in a selfie or two as they captured the once in a lifetime thrill. 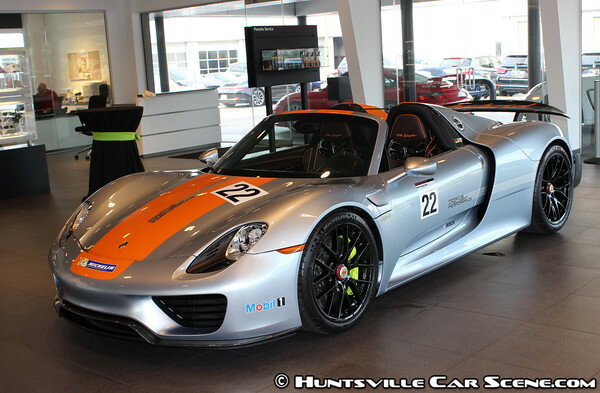 My only question is what Porsche of Huntsville will do to top this great event…guess we will have to drop by soon to find out! 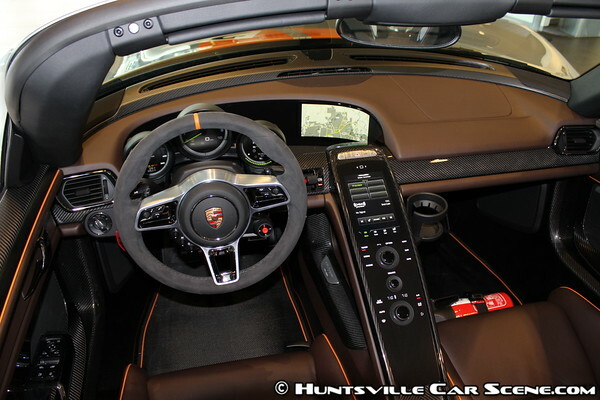 Porsche of Huntsville is always ready to provide optimal customer service, however setting up a test drive of this vehicle may prove to be difficult because this one is sold and the proud owner is probably out enjoying this wickedly fast ride as we speak. One thing we know for certain is when he does take it out for a spin, it will most definitely turn some heads! Wow! What an amazing car. Thank you for sharing the news and the write up! YW It was quite a vehicle!! The more you looked at it, the more little things you noticed!